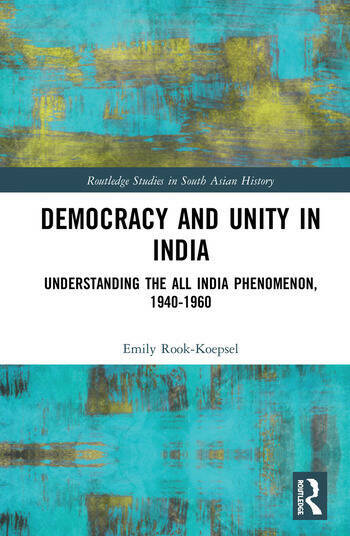 This book analyses the ways in which organizations and individuals in India grappled with and contested definitions of democracy and unity in the decades directly preceding and following independent Indian statehood. The All India Scheduled Castes Federation and the All India Women’s Conference are used as case studies to explore Indian Dalit and women activists’ attempts to reconceptualize universal citizenship, Indian identity, dissent, and principled democracy during a moment of uncertainty in India’s political life. The author argues that, because the Indian nation and the Indian state remained in flux during the 1940s and 50s, marginal political actors, writers, social activists and others were able to propose novel forms of democratic participation and new ideas about what it would mean to be a unified state that appreciates political responsibility, a respect for difference and a broader perspective of the population. Moreover, this book suggests that this redefinition of Indian politics is more widespread than generally understood and considers how strategies used by both organizations featured have continued to be part of the national story about democracy and dissent in India. Through an examination of public discourse, caste politics, women’s rights advocacy and popular literature, this book excavates the traces of fundamental uncertainty regarding definitions and expectations of democracy and unity in India. It will be of interest to academics in the fields of modern South Asian history, democracy and nationalism, postcolonialism, gender studies, political organisation and global history. Emily Rook-Koepsel is the Assistant Director of Academic Affairs at the Asian Studies Center at the University of Pittsburgh, USA. Her most recent articles consider the link between state violence, public order, and dissent in India.